Sir Michael Rawlins, President of the Royal Society of Medicine and former Chairman of NICE has this morning spoken with BBC Radio 4 Today program about the new version of the Medical Innovation Bill (Saatchi Bill). Published in the Telegraph today Lord Woolf, former Master of the Rolls and Lord Chief Justice, writes from the legal perspective why the Saatchi Bill is necessary and why it has his support. Maurice Saatchi is passionate about the legislation he is promoting to encourage responsible innovation in medical treatment. He has a very personal reason for his campaign. His wife, the novelist Josephine Hart, died of ovarian cancer in 2011 and he believes, in his own words, “that her death was a wasted death, indeed that all 165,000 cancer deaths in this country every year are wasted deaths because science advances not one centimeter as a result of them”. His bill aims to change that situation. My own reasons for giving my support to his plans – currently the subject of a Department of Health consultation that ends tomorrow – arise from my work as a lawyer. I have not, thankfully, had to face a similar domestic tragedy to his, but what I do know about, from sitting as a judge, are the cases where doctors are sued for negligence because they have innovated in the treatment they offer, rather than following generally-accepted medical standards. In my experience, professional people are, on the whole, very conservative, and it is cases such as the ones I mention that make doctors frightened to try something different, something not yet fully tested, even when their patients give their consent, and when, as was the case with Josephine Hart and many others, they face certain death if standard procedure is all that is on offer. Doctors don’t by nature want to step out of line, risk their professional reputation, or being labelled a quack by colleagues. That is, most of the time, a good thing. 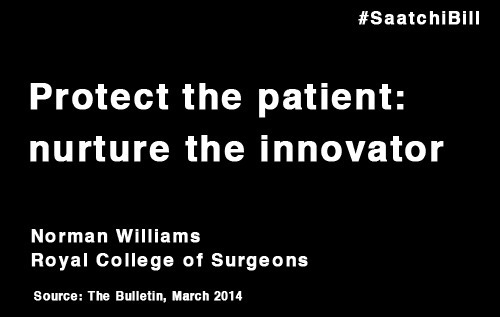 There should not be a culture in our hospitals of risk-taking with patients’ lives. But what is covered in these plans is a very specific set of exceptional circumstances, where there are potential benefits to allowing doctors to put their heads above the parapet. It is important to understand here that we are talking about a new law that will make a limited, but significant contribution in a small number of difficult cases. 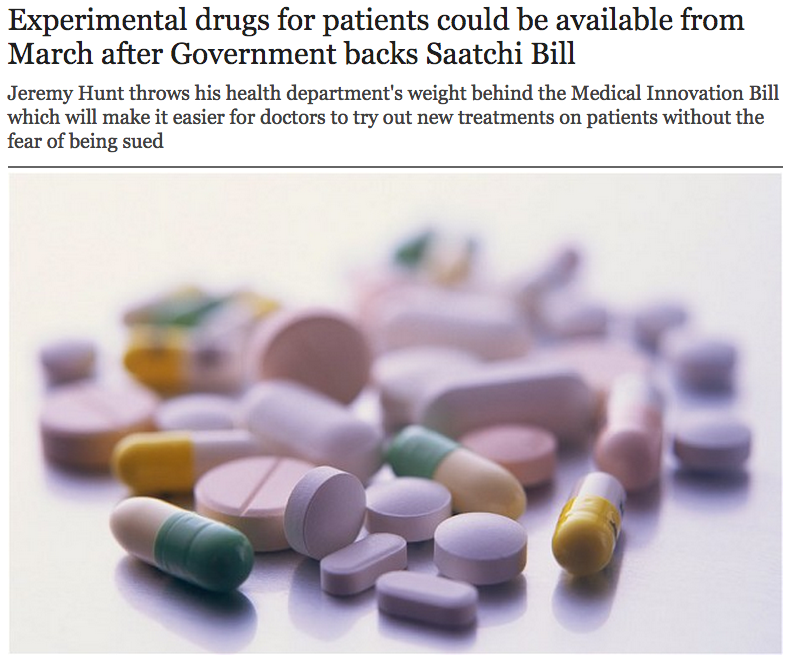 Maurice Saatchi, with the support of Health Secretary, Jeremy Hunt, and of the government, is seeking to introduce legislation that will only apply to: (1) patients who are not responding to conventional treatments; (2) patients who give their consent to such innovation; (3) new treatments that are still at a experimental stage; (4) new treatments that hold out a real prospect of being able to help, both the patient and others in similar circumstances who come after them. It shouldn’t require too much imagination to envisage those that these proposals might help. If you are a patient suffering with a terrible cancer, where conventional treatment has proved ineffective, your doctor may be aware of something else that could be of benefit, but which has not yet gone through the currently very long process of being fully tried and tested. It can take 15 years and £1 billion to approve just one drug. By the time that has been done, the patient will be dead. At the moment, the doctor’s hands are tied – by concerns about professional reputation and potential negligence claims. That needs to change. Crucial to the whole proposal is the principle of true consent. Patients may be in exceptional circumstances, facing death under standard procedures, but that doesn’t mean they are incapable of saying yes or no. Many will, indeed, refuse to be treated as guinea pigs, but some will decide to consent, because they believe it offers them hope of extending their lives, and perhaps saving the lives of others in years to come. Surely, the patient, as the person most affected, must be allowed the chance to make up their own mind in such circumstances. There must, of course, be safeguards, and to achieve true consent the proposed legislation will require very careful drafting, and close scrutiny by the revising chamber of Parliament, the House of Lords, where I sit alongside a number of very distinguished lawyers and medics. Indeed, it has been the decision of some of those senior medical figures in the Lords to give their support to Maurice Saatchi’s plans that has persuaded me to line up behind him in arguing for this change to the law. It would be a mistake to think, as some are perhaps tempted to do, that what is being proposed here is part of another current debate – over giving the terminally ill the choice to determine how and when they will die. 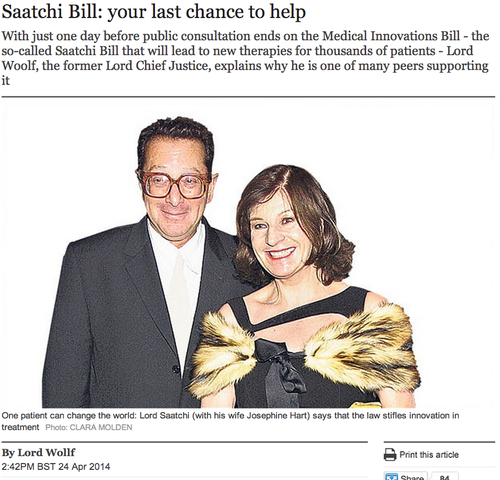 Maurice Saatchi’s proposal is about is extending and saving life, not cutting it short. That should make it more readily acceptable. I therefore urge Daily Telegraph readers to make their voices heard in the current consultation round by following the link below.